Conventional wisdom says that this passage is best done at night, for two reasons. One is the distance. It is just long enough that sailing would take longer than the hours of daylight in a day, so the choice is to leave in the wee hours of the morning and arrive before dark, or to leave in the evening, sail through the night and arrive with plenty of light to navigate the unknown waters of a new country. The second reason is a safety reason. A few years ago there were some attacks on boats heading from Grenada to Trinidad. These happened during the day and since then most cruisers have chosen to go at night, and there have been no attacks. 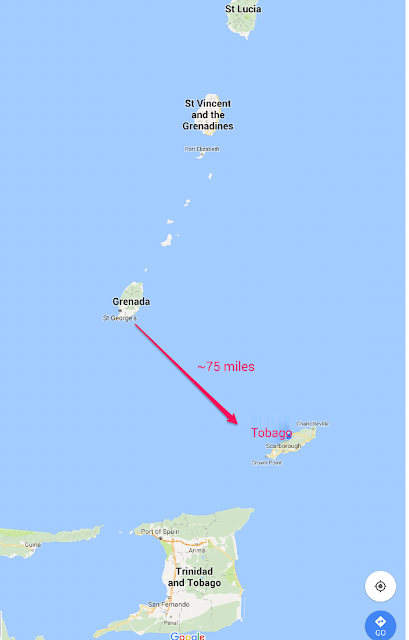 Since we are going to Tobago and not Trinidad we feel that we are safer, but we still chose to go at night, and chose to run dark, no lights shining to announce our presence. We left Prickly Bay in the early evening having said our goodbyes and made all of our passage preparations. We pulled out of the bay, all systems go and then in about 1/2 mile our instruments quit. The only thing we had was depth. No GPS, no wind speed or direction, no autopilot. We do have backup charts on the Ipad, and we discussed trying to make the passage using it, but we were not comfortable using just the Ipad with no other backup. 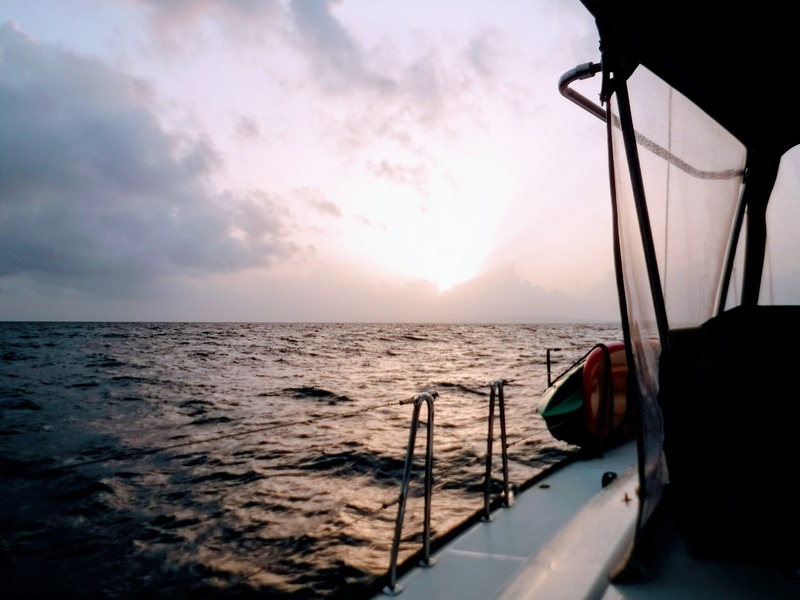 We made the choice to pull into another bay in Grenada, put down the anchor and try to fix the instruments. After setting anchor we wiggled connections, turned things on and off, pulled fuses to try to locate the source of our problems. It took about an hour, and some combination of what we did turned the instruments back on. Now came the question, do we pull anchor and head to Tobago now? We decided to wait another day and see if the instruments would continue working, and then we would head out the next night. 24 hours later, all instruments still working, we head off again. This time we were over a mile out when the instruments conked out, after having been fine all day. Bob was down below testing fuses and wiggling wires. This time the instruments returned quickly and we made the decision to continue and fortunately the instruments worked all night (although they are not working again as I am writing this). This was our second overnight passage, and it was different from our passage to St. Martin. 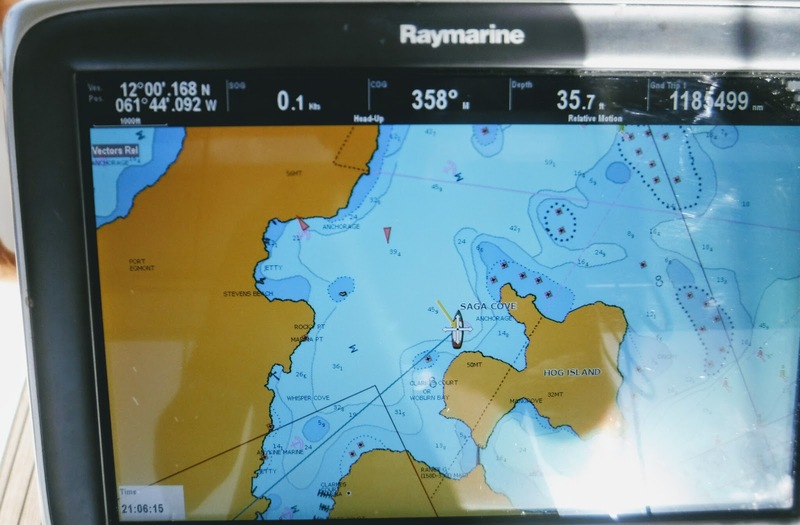 The weather was warmer, the winds were more favorable (we were able to sail almost the entire way), and there were very few boats, no sailboats, and no one going in the same direction we were. Being able to sail the distance gave me a sense of accomplishment. We did it ourselves. It is so nice to be able to harness the power of the wind, rather than fossil fuels. Bob and I alternate our watches. I started out with a 2 hour shift and Bob reciprocated. My next shift went for 3 hours both because I was awake enough for it and because I wanted a three hour block of time for my sleep. After that we went back to 2 hours, the day began and we were both up for the final push into Tobago. There is a real beauty to sailing at night. The stars were out in full. I have discovered Scorpio, a lovely curving constellation, and right in front of Scorpio is Libra (fun for me as that is my zodiac sign). Libra was once considered to be the claws of Scorpio. The moon rose on one of my watches. It looked quite like a watermelon slice, rind and all. Behind the boat we could watch the bioluminescence sparkling in our wake. The lights of Tobago became more distinct, guiding us toward our destination. The rising sun made the entire ocean take on a soft pink hue. 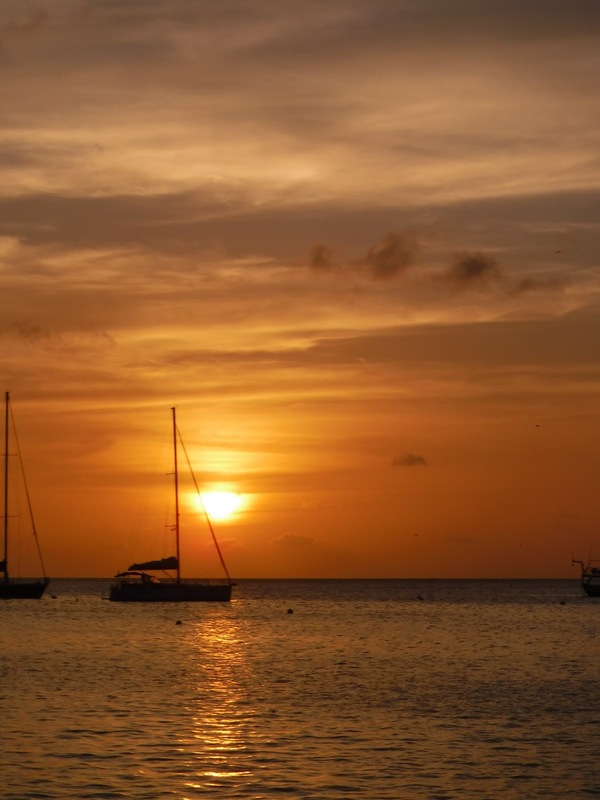 As the day got brighter the lights of Tobago began to go out. There was a time in the transition that actually made it harder to see. The lights had gone out, and yet there was not quite enough light to make out the details of the land. That was followed shortly by full daylight and enough clarity to find our way into Store Bay, Tobago, our first destination in Tobago. Next adventure- Customs and Immigration, what fun. It was a gentle,for 20 knot winds, night.